“Technically he is still a priest but he is not authorised to conduct any services or perform any functions in relation to the church, hold any office or ministry,” the Archbishop said. Asked if Swaratsingh had ever lodged an application to resign as a priest, Gilbert said, “No. He officially has a leave of absence. He never applied for a dispensation. However he is suspended because of the civil marriage ceremony he went through.” Swaratsingh married Denise Oliver after leaving the Church in 2003. At a press briefing held in his constituency office at 106 Eastern Main Road, Petit Bourg, Swaratsingh dismissed concerns over whether or not he remains a priest. Referring to several allegations, including those on questionable financial transactions during his past tenure at the St Patrick’s RC Church, Newton, he addressed the issue of his place in the clergy. He said that he made a deliberate choice not to fill out a form that is required for an application to be dispensed from the clergy and argued that he has done nothing wrong. “If it is a crime, then let the Vatican police come and arrest me. But I will tell you this, once a priest, always a priest,” he said at the press conference which was held at a small room packed with noisy PNM supporters who crowded the back of the room. “Of all the allegations, this one (about being a priest) tickles me the most. As you may know, I resigned from the priesthood on or around October or November 2003. And the only person who I had discussions with about me leaving the priesthood would be the Archbishop and myself. We are the only ones who had that conversation,” he revealed. Gilbert also confirmed that Swaratsingh, who was formerly parish priest of the St Patrick’s RC Church, was investigated by the church over allegations of financial impropriety at that parish. Of the process involved in resigning as a priest, Swaratsingh said yesterday, “The process is when you leave the priesthood, you go to a Canon lawyer and you fill out a form that you send to Rome, asking for what you call laitisation or commonly referred to as to being dispensed from your vows. He argued that his status as a priest was irrelevant to his candidacy, even as questions over his competence and his background have emerged because of the issue. “The only person who is affected by me not doing that (filling in the form) is me. Because the consequence of me not doing that is that I, as a Catholic, cannot have access to the Church. In other words I can’t get married in the Church, I can’t have communion. But to say that because of that I am ineligible to be a candidate for the elections, I do not know of any part of our Constitution that says so,” he said. Swaratsingh was asked for clarification on his status in terms of whether or0 not he remains a priest. He said, “I am Kennedy Swaratsingh, member of Parliament for St Joseph and Minister of Public Administration!” Swaratsingh is no longer MP for St Joseph, as the Parliament was dissolved on April 8. He is only a candidate. However, his response drew applause and cheers from the supporters assembled in his office. Roman Catholic Church sources yesterday noted that the form applying for dispensation under Canon Law requires the applicant to disclose the circumstances that led to the priest’s desire to resign. Swaratsingh was said to have resigned as a priest of the St Patrick’s RC Church in December 2003. He was replaced by Fr Henry Charles, who last year attracted controversy after he was forced to resign his post as Chairman of the Integrity Commission due to Canon Law and amidst a plagiarism controversy. “If they say I am still a priest, I have many children.” Once more, the crowd assembled in the cramped constituency office erupted in cheers. Swaratsingh then walked off, leaving the media behind and embarking on a walkabout starting along the Eastern Main Road, his red PNM shirt emblazoned in the sun. Questioned earlier at the press conference about allegations – made by UNC chairman Jack Warner this month – that he has exorbitant spending habits and that he has a “black credit card” entitling him to large spending limits, paid for by a “third party”, Swaratsingh said, “Today I call on First Citizens Bank to clear the air. It really says to me that our systems cannot be trusted. I ask FCB to investigate how my credit card information could come out to the public,” he said. Pressed for details on the alleged “black credit card” Swaratsingh said he had only one credit card. An attorney present, Faris Al-Rawi, who oversaw Swaratsingh’s press conference, intervened, blocking further queries saying Swaratsingh was already giving out private information, which he did not have to. At times during yesterday’s press briefing, Al-Rawi also answered questions on Swaratsingh’s behalf. Asked if he could explain who were the owners of a holding company which bought a $5.3 million property in Moka, Maraval where he now resides, Swaratsingh said, “I am not party to that transaction. I have no investments in the house…I have nothing to hide.” He said the house was bought by a “family company” but did not name the owners. He said he would declare his assets to the Integrity Commission today and noted that as a person in public life he is only obliged to declare his, his wife’s and children’s interests. Later asked if he holds any beneficial interest in the $5.3 million property bought by a company which lists his mother as a director, Swaratsingh said, “no”. Asked if the property was being held on trust for him, he said, “no”. At this point in the press briefing, his attorney Al-Rawi, son of former PNM minister Diane Seukaran, once more intervened, blocking follow-up questions and saying, “those are matters that will have to be declared to the Integrity Commission. He has made his full declaration in full compliance with the law.” Al-Rawi also noted that the purchase of a house using a holding company was a “perfectly well organised” and common transaction designed to incur lower stamp duties. He denied any wrong-doing on Swaratsingh’s part. The Indo-Trinbago Council has referred the real-estate transaction to the Integrity Commission. Is this really news? So what if he is atill considered a priest? What is the substance here, why is being a priest so important to writing such a lengthy column?????? Exactly!!! Big Steupssssssss! I don’t know why they ent post the video of Jack Warner giving potential voters money in Embacadere! Post real news!!!! 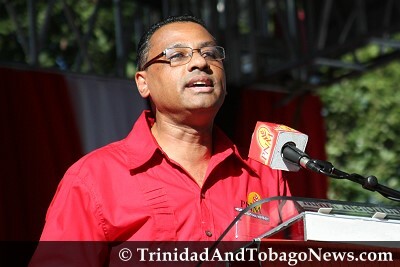 Even though he cannot access the sacrament of holy communion, People’s National Movement (PNM) St Joseph candidate, Kennedy Swaratsingh, remains a devout Roman Catholic. KENNEDY Swaratsingh may have broken no law of this land. But some of the details which emerged this week about the manner in which he walked away from the Roman Catholic priesthood, and about his current living arrangements, leave many questions unanswered, despite the news conference on Thursday, following those revelations. AMIDST questions over his history in relation to his time as a priest, documents emerged yesterday which suggest it was Public Administration Minister and the PNM’s candidate for St Joseph in Monday’s General Election, Kennedy Swaratsingh, who advised the National Library and Information System (NALIS) to cancel the UNC’s manifesto launch earlier this month. Maybe its upon the reflection of that word integrity that seems to be flaunted around now , if we hear it enough with regards to this individual would it then have meaning? Knowing that it at least takes nine months before a child from the time of conception is born..one can only wonder what is really the truth . Maybe I am wrong and should confess to FR Swaratsingh..
Mr. Swaratsingh said he left the Roman Catholic Church in 2003 NOT 3 years ago (substantiated by His Grace the Archbishop of Port of Spain). What kind of creative, twisted biology and math are you practicing? Are you so eager to malign him that you would just make things up as you go along? You are not interested in the truth because the truth shall set you free and you are enjoying being chained to your ignorance too much. PNM to find it laughable. Weknow and understand that this is silly season but the silliness should be for the politicians not people parading as journalist. Their definitely stories of a more intrinsic nature to be covered than than a [politician’s priestly vows. While the Press continues to say it covers news, it is ‘news’ in favor of not ‘news’. So what, bening a preist and a polition is a good thing he will beable to teach then about god. My be he is the one that the father his sent to save us from people like jack warner and the others Stay up god bless. Better an Ex-priest than a former flawed and biased Judge, I know who I’d rather vote for. Those who have taken the time to learn about Volney will certainly choose the ex-priest. Kennedy Swaratsingh lied through his teeth and is still under investigation by the Catholic Church – the archbishop said so. Why you think he does not want to lodge an application to resign as a priest? It is because he has to put in writing the real reason he is leaving the church and I doubt he wants to put the truth on record. He is not under investigation by the Catholic church. Why not read what the Archbishop actually said instead of just making things up as you go along. My bad, you’re correct there. Why did he not follow the procedures to resign? He has not formally resigned. Then about his #6.000.000home which he says he knew nothing about (my words) which is owned by his family… Come on… I believe he used the cover of a company with his family to hide his assets. There are questions of impropriety surrounding him, not that he should be disqualified on that basis, but they demonize opposition members for less.